To prepare the fritters, place the broccoli, spring onions and garlic into a food processor and blend until just textured. Place into a bowl, add the ground almonds, ground cumin and coriander and chilli. Stir in the eggs and basil leaves until a stiff batter forms. Season with a little coarsely ground black pepper. Heat a non-stick frying pan over a medium heat, spray with a little olive oil. Spoon the mixture into the frying pan and leave to cook for 1 to 2 minutes before turning over and cooking on the other side until golden. Keep warm until all have been cooked. To prepare the sauce, put the lime juice and zest, quark and parsley in a bowl. Stir well. 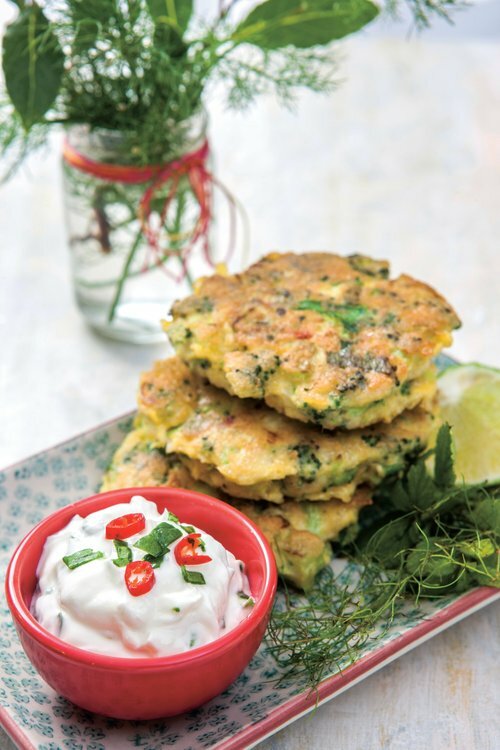 To serve, tower up 3 fritters and serve with a little lime dressing and salad.